This young lady is not only beautiful but also very talented. I'll be honest with you, the 1st time I heard her on the radio I thought it was Thalia singing.Yes I am a Thalia fan, I'm not comparing them but look how far Thalia has gotten with that voice. Margarita has got an incredible voice and she is so full of energy. I promise you this, she had no idea these pictures would end up on the internet. By looking at these pictures it's easy to see how playfull she was for my camera. Which only goes to show how good she is with her fans. These ladies can dance Who me? What a beautiful voice I don't know why but I luv that belt she has on. Me da Escalofrios Smile ur on the KamCam Margarita... Thanx for being so sweet to my camera! I tried to get every1 on this shot, but I missed a few. Sorry. Once again Margarita and her band has impressed me with their talents and great personalities. This time I was able to catch their show at the worlds largest Tejano club...Tejano Tx! This young ladys voice is just so..there. What I mean is that her voice is at a point where I know shes gonna become one of Tejanos best. Recently I heard someone say "shes hair and teeth" implying its her good looks that had me impressed. Well the first time I heard her sing was over the radio, and I literally had to pull my car over into a parking lot just to listen. I wanted to give the song my complete attentiom, because I was confused at the idea that they were playing Thalia on KXTN. After awhile I realized it wasn't Thalia but instead a new singer by the name of Margarita that sounded as good as Thalia..and trust me when I say I think Thalia has an incredible voice. After hearing more of her songs I saw that it was only that song that she sounds alot like Thalia, her versatile voice just keeps on impressing me. This last time I saw her the people I was with were impressed but kept telling me I was wrong that she didn't sound like Thalia, then outta no where Margarita went into her rendition of Amor Ala Mexicana..my friend looked at me when it was over and said " Holyshit that was incredible". 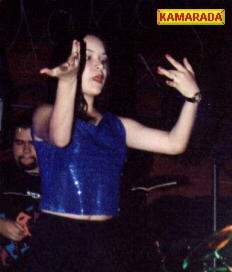 Margarita is a very beautiful woman this I won't deny, but even with your eyes closed this is one impresive singer. I got the honor of meeting her this last time and she was nothing but nice to me, as were the others in her band. I sat there watching her as sweat dripped off her face, from all her dancing on stage. As tired as I could tell she was, instead of rushing to the back to cool off...she greeted her fans with a smile and posed with them for pictures and signed autographs. Well I didn't mean to write a book here so I'll leave it at that..but I'd like to thank Margarita, the cutest bkup singers in the business(the twins),and her manager Fred whom was very considerate and just an all around nice guy. To your talents and kind hearts I dedicate this section on my page. 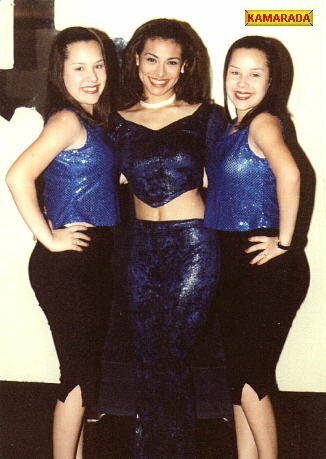 I had the great pleasure of having Margarita, Jessica and Joenie Guerra pose for me backstage. I wanted to share these shot with my visitors.